Fuel used to increase the power of a fire. A form of defense used in criminal procedure wherein the accused attempts to prove that he or she was in some other place at the time the alleged offense was committed. come into sight; become visible or noticeable, typically without visible agent or apparent cause. Dissection of a body to determine the causes of the death. A legal officer to whom some degree of authority or jurisdiction is given. A club of less than arm's length made of wood, rubber, plastic or metal carried for forced compliance and self-defense by law-enforcement officers, correctional staff, security-industry employees and (less often) military personnel. A law that codifies most criminal offences and procedures in Canada. Its official long title is "An Act respecting the criminal law" (R.S.C. 1985, c. C-46, as amended). Section 91(27) of the Constitution Act, 1867 establishes the sole jurisdiction of Parliament over criminal law in Canada. Action which caused the death, for example a blow in the head, by opposition to the medical cause, in this case the brain haemorrhage. the place from which a military unit is commanded. the system of allocating police officers to particular areas so that they become familiar with the local inhabitants. Investigating judge charged in suspicious deaths. a tribunal presided over by a judge, judges, or a magistrate in civil and criminal cases. a person who carries out a formal inquiry or investigation. a criminal code is a document which compiles all, or a significant amount of, a particular jurisdiction's criminal law. Typically a criminal code will contain offences which are recognised in the jurisdiction, penalties which might be imposed for these offences and some general provisions. Canadian Security Intelligence Service's role is to investigate threats, analyze information and produce intelligence. a report prepared each day to provide essential performance information for a particular property to its management. minor crime, esp. that committed by young people. A detective is an investigator, either a member of a law enforcement agency or a private person. Visual warning lights fitted to a vehicle for use when the driver wishes to convey to other road users the urgency of their journey, to provide additional warning of a hazard when stationary, or in the case of law enforcement as a means of signalling another driver to stop for interaction with an officer. Discreet surveillance of a place or an individual. denoting or relating to a motor accident in which the vehicle involved does not stop. a person seized or held as security for the fulfillment of a condition. a closed-door hearing in judge’s chambers, usually concerning sensitive child-related issues. Informant of the criminal environment. a person confined to an institution such as a prison or hospital. The work of inquiring into something complex and systematically. An official person who presides over court proceedings, either alone or as a part of a panel of judges. Supreme rule of law, general and impersonal, or all formed such rules. Someone who makes practical application of abstract legal theories and knowledge to solve specific individualized problems, or to advance the interests of those who retain (i.e., hire) them to perform legal services. accuse someone of something, esp. an offense under law. A warning given by police to criminal suspects in police custody (or in a custodial interrogation) before they are interrogated to preserve the admissibility of their statements against them in criminal proceedings: "You have the right to remain silent. If you give up that right, anything you say can and will be used against you in a court of law. You have the right to an attorney and to have an attorney present during questioning. If you cannot afford an attorney, one will be provided to you at no cost. During any questioning, you may decide at any time to exercise these rights, not answer any questions, or make any statements." Reason which urges somebody to commit this crime. Any violation of the law committed by the driver of a vehicle while it is in motion. a solemn promise, often invoking a divine witness, regarding one's future action or behavior. Who has committed one or more offenses. A lachrymatory agent (a chemical compound that irritates the eyes to cause tears, pain, and temporary blindness) used in policing, riot control, crowd control, and personal self-defense, including defense against dogs and bears. The police ethics system enforces the Code of ethics of Québec police officers, which oversees the conduct of all Québec police officers, wildlife protection officers, special constables, highway controllers and UPAC investigators. person who has the function of enforcing the law, maintain order and ensure public safety. A police raid or dawn raid is a visit by the police, immigration officers or other officials often in the early morning, hoping to use the element ofsurprise to arrest targets that they think may hide evidence, resist arrest, be politically sensitive, or simply be elsewhere during the day. 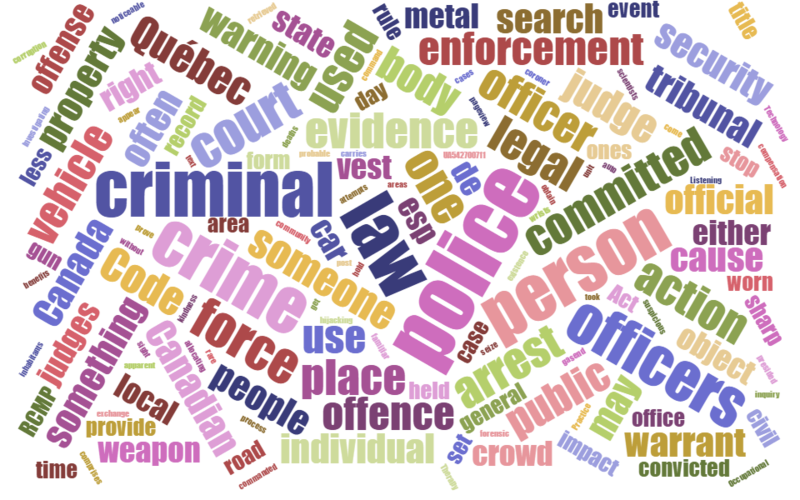 All which concerns a crime and can be used to facilitate a investigation or a trial. The Royal Canadian Mounted Police is the Canadian national police service and an agency of the Ministry of Public Safety Canada. The RCMP is unique in the world since it is a national, federal, provincial and municipal policing body. institution to rehabilitate minors posing discipline problems and delinquency. A court order issued by a magistrate, judge or Supreme Court official that authorizes law enforcement officers to conduct a search of a person, location, or vehicle for evidence of a crime and to confiscate evidence if it is found. Action to follow and to observe secretly and attentively the movements, the actions of one or several individuals. The Service de Police de la Ville de Montréal is the second largest municipal police force in Canada. Sûreté du Québec is the only Québec police organization to have jurisdiction over all of Québec and to carry out such a wide variety of mandates. It operates at all levels and in all sectors of public security, including police activities in the municipalities it serves, road safety interventions and local and international criminal investigations. Somebody whom we suspect of having made a crime. one or more persons using terror for political purposes. Any person or institution with the authority to judge, adjudicate on, or determine claims or disputes, whether or not it is called a tribunal in its title. A use of force continuum is a standard that provides law enforcement officials & security officers (such as police officers, probation officers, or corrections officers) with guidelines as to how much force may be used against a resisting subject in a given situation. A victim is a person who undergoes a crime. a warrant issued by a judge on behalf of the state, which authorizes the arrest and detention of an individual, or the search and seizure of an individual's property.